Eliminate your competition using these proven and cost free strategies to establish yourself as THE expert in your field or industry. Michael Hart's " Business Marketing Network"
Plan Your Meetings Editorial Director Kristi Casey Sanders explores some of the biggest issues meeting planners and suppliers are grappling with today and offers some simple solutions for adapting, innovating and growing your business during “The Great Disruption” we are currently experiencing. · Determine the top 5 "must-haves" for your life and your business. with the results you want. · Define an easy, trackable action plan for the year. · Capture key Action Strategies to guarantee your survival and victory in the tough economic market of today. Plans and positive perspectives are all great, but without productivity they are dead. Time is real and actions matter. Put them together with some accountability – What will you do and By When? – and you’ve given your dreams feet to win the race. Got a goal? Get accountable. You will use this third webinar to lock in your actions on a timeline, catapulting you towards success in no time flat! There’s a saying that goes, “As the mind goes, so goes life.” Science has proven that the brain directs behavior. Are YOUR thoughts and beliefs putting you on the road to success? In this 2nd Webinar you will learn a simple, powerful tool to re-train your brain to produce better results, both in business and in life. Too often business owners lose their shirts building services, products and even companies they’d never want to use, or work in. Stop wasting motion and get busy creating a company you love working in. Meetings will never go away. As businesses continue to tighten the bottom line, some meetings will get cancelled, consolidated, reduced in size or executed virtually, but people will always need to meet face to face. The way meetings are conducted, however, is going to change. And meeting planners need to stay on top of technological advances, corporate initiatives, budget restrictions, attendee expectations, meeting innovations and organizational goals or risk becoming obsolete. Don't just adapt; innovate. As a meeting professional, you have more power than you think. In this session, Plan Your Meetings Editorial Director Kristi Casey Sanders will teach you three simple ways you can make a big difference. In today’s fast paced society, e-mail marketing is becoming the favored communication method. More and more people are depending on e-mail to get the word out about their services. It is cost-efficient, provides a means to get your message out to a larger group of people in a shorter amount of time, and provides an easy method to respond with interest. As with any marketing program, there is a right way and a wrong way. We will teach you the right way and provide you with information you can use to make sure your e-mails work for you. In today’s work environment, just doing a good job isn’t good enough. You need to know how to communicate your worth and share your successes. Plan Your Meetings Editorial Director Kristi Casey Sanders leads this interactive session that will teach you how to calculate your event ROI, and effectively communicate how the work you do contributes to your company’s bottom line and fulfills organizational goals. What do Dan Kennedy, Jay Conrad Levinson and Jeff Gitomer all have in common? They understand the importance of repetitive marketing. Experts tell us that it takes a minimum of six times contacting a prospect before they're ready to trust you. Let us help you build that trust. Join Speaker Marketing Expert, Brenda Keefer for this live webinar. We will cover issues that speakers, trainers, coaches and consultants face today. Bring your questions and prepare to learn how others are making their marketing count in today’s economy. Dan Kennedy, the world’s #1 marketing consultant and best-selling author, has agreed to give you $613.91 of his BEST Money-Making and Marketing Information for FREE…but his is NOT an open-ended offer. Dan will only make this offer to those attending the webinar. That’s how it feels sometimes, doesn’t it? With so much “noise” out there, so many people vying for the attention (and wallet) of your prospective clients or attendees, how do make speaking business, your education programs, meetings, conferences and products stand out and generate revenue? You can do it the way everyone else does (and join the “blah blah blah” chorus) or you can do it differently. According to Terri Langhans, CSP, you’ll get better results when you resist the usual, expected and ordinary approaches and learn, instead, how to connect to what your target audiences truly want, and communicate it in a way that gets better response. Blah Blah Blah: How to Make Your Marketing Stand Out, Get Better Results and Attract More Business is ideal for speakers and meeting planners who want more bookings, higher sales and better attendance at their events. Distinguish your business, meeting, products and services from the competition. Find your points of difference no matter how much you look like the other guy. Create a competitive edge no one can copy. Focus your marketing message in a meaningful and memorable way that generates response. concept development that resulted in a 60% increase in attendance. Two decades ago Michael Hart was a flat broke high school dropout pushing a lawn mover for six dollars an hour. 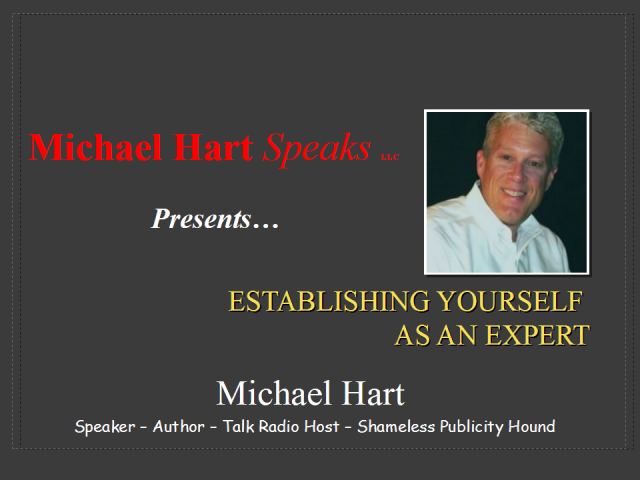 Today he is considered one of the leading experts on building a business by harnessing the power of publicity. Learn the inside secrets Michael used to catapult his sales career , build five companies and a lucrative speaking and consulting career all by exploiting the media's insatiable appetite for information! Business leaders have a choice to deliberately design and craft their company culture or to just let it happen. Which do think is a Roadmap To Success? How does your company measure up? Learn how to design your company culture. Webinars are becoming a standard part of any speaker’s repertoire…but many good speakers resist doing them. Get over it. Learn how they can help you extend your brand, create inexpensive website content and even new revenue streams. Join professional speaker Wayne Turmel, president of www.greatwebmeetings.com and the author of “6 Weeks to a Great Webinar” for this honest look at the changing world of professional speakers. Things have changed and they're not going back to the way they were. In a fast-paced, information-intense 30-minute presentation, Mike Wittenstein will share some new ways for Meeting Planners to look for new kinds of business. It will never be ‘business as usual again' and Mike has some powerfully simple ideas that will help you work smarter and more effectively. In a conversation with Chairwoman-Elect of Meeting Professionals International and President of Benchmarc360, Inc. Ann Godi, Mike learned that meeting professionals are not always recognized for the strategic role they play in helping their organizations deliver on objectives and producing results. Mike believes that the higher-order values a meeting professional brings are about improving communication, facilitating relationships and having a direct role in developing strategy in addition to execution. He'll explain what this might look like touching on use of social media, new approaches, new services, and Don't miss this compelling presentation. Is it possible to navigate office politics without becoming a political animal? Learn the difference between office politics and organizational awareness. Discover the unwritten “rules of the game” at work. Understand the dynamics of power and influence in your organization. Times are tough in the events and meetings industry. If you want to keep your schedule full you have got to be more creative than ever. Join Speaker Marketing Expert Brenda Keefer and Marketing and Media Pro, Michael Hart, for an in your face, no holds barred, down and dirty look at what it's going to take to succeed as a highly paid professional speaker in 2009. Make sure you have plenty of paper and pencils on hand for this information packed program! Your questions will be answered by the experts - LIVE! "Are you moving toward extinction or distinction?" It has to be one or the other. As a speaker, if you aren't striving to move forward and using the technology available to you to market your message....get ready to become a dinosaur. Let Speak Easy show you the technology available to help you stand out from the thousands of other speakers who also prefer distinction. Sign up for our Marketing for Speakers webinar and learn some of the marketing secrets, how to utilize your social network and what mistakes to avoid. Let us help you Speak Easy. Unintentionally, salespeople actually create the hurdles that prevent or prolong sales. By approaching sales the wrong way, or by skipping steps and rushing the sale, you actually increase the number of objections you get. In this instance, the objections aren’t real… they’re designed to just get rid of you. In the Stress-Free Selling® approach, you will create a comfortable experience for the people you hope to do business with, and you’ll create desire before you ever talk about price. What will happen is you will sell more, more easily and at higher prices. Price is an obstacle when people really aren’t interested in what you have. In This session, you will discover how to make objections disapppear...making sales easier, faster and stress-free. The programs are presented by business experts from a variety of marketing and consulting organizations and associations. Although we strive to offer informative and helpful programs, the individual presesnters and/or groups are solely responsible for the content they present.